In Episode 51 of The Electric Shadows Podcast, Robs Daniel & Wallis looks back at the movies that impressed them at the BFI London Film Festival 2018. Rob Daniel valiantly battles through a heavy cold to impart his movie opinion. Rob Wallis, being younger and of a generally tougher constitution, is on finer form. Movies discussed range from the thrilling (Widows, Suspiria), to the moving (If Beale Street Could Talk, They Shall Not Grow Old) to the plain batsh*t crazy (Sorry To Bother You, In Fabric, Mandy). What’s the story: Brent (Cage) and Kendall (Blair), both in the grip of mid-life crises, live in a state of increasing resentment with their kids Carly (Winters) and Josh (Arthur). Then, without warning, parents all over the country begin violently turning on their children. What’s the verdict: Reportedly, Nicolas Cage declared this the most enjoyment he has had making a film in ten years. We’re right there with you Nic. 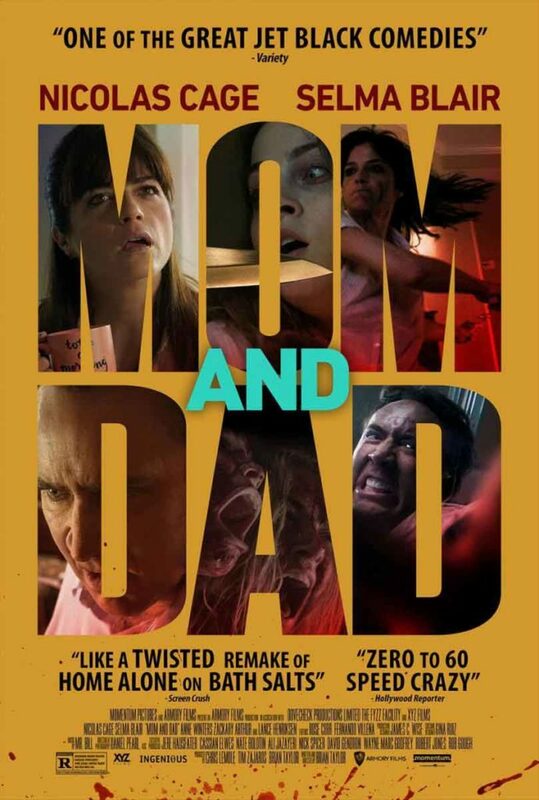 What seemed like another direct-to-rental dud, Mom and Dad is a short, sharp, sensational satirical shock.